I had a new experience on the bluebird trail in mid-July. I went to band babies in Box 4 at Kensico Cemetery on July 13. 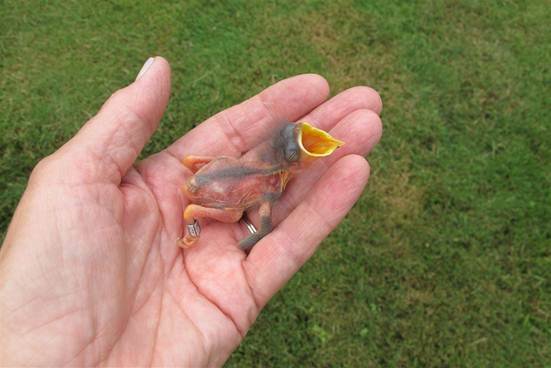 The babies were 6 days old, and I was greeted with all four babies desperately begging for food – beaks wide open. A similar experience last year told me that something had happened to their parents and these abandoned babies would starve to death if I didn’t do something. I made the quick but scary decision to get them adopted. 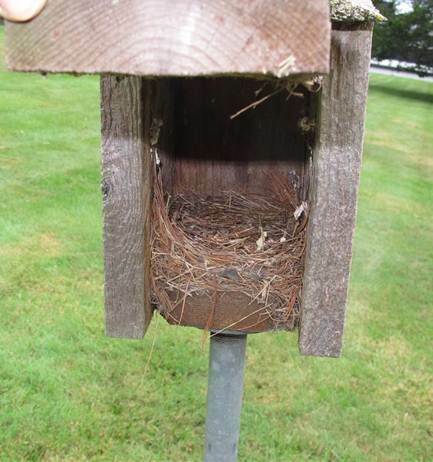 We fortunately had two other nests at Kensico with nestlings a couple days younger, plus a nest at nearby Landmark commercial property with babies the right age. I banded 3 of the 4 babies before I put them into the adoptive nests so I could keep track of them. Unfortunately, the 4th baby was a tiny runt and too little to band (even though it was 6 days old). The first baby (not the runt) went to box 1 at Kensico, which already had 5 nestlings. I prayed I wasn’t putting all of them at risk by adding a 6th. The second nest at Kensico had 4 babies. I added a 5th, one of the adoptees, and then because I didn’t know what else to do, I added a 6th – the tiny runt. I took the last adoptee to Landmark, giving that nest a 5th nestling. This was all during the extreme heat wave and I knew that it was the second brood for these adults, so I was more than worried about all these babies. I did observe that each of these 3 nests had both male and female adults bringing food to the nests. I went back the next day. 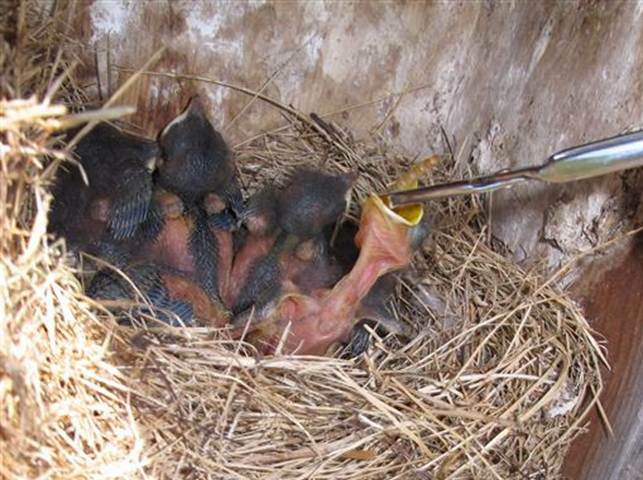 The nestlings were all alive, but some of the nestlings in the Kensico boxes were begging for food and the runt was begging non-stop. Had I done the right thing??? I went back the day after that. 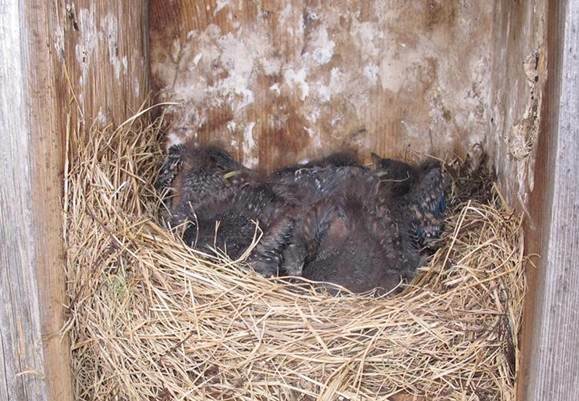 Again, the nestlings were all still alive . . . and all the birds now seem to be well fed (they were not begging) except the runt. It occurred to me I might help a little by providing some mealy worms, and found some at a pet store. I tacked a cup of meal worms on the top of the boxes in Kensico and the adults immediately took advantage of the free food. I fed “Tiny” a little extra for 3 days, but could only do this once a day. I finally felt confident to band the rest of the babies. The adoptees were 10 days old and their nestmates were 8 days , but looked the same age. I banded the original nestlings on the left leg so I could keep track of which were the adopted ones. Tiny was still too little to band, but he was still alive. I checked the next day (babies 9 and 11 days old). All were alive and well, except sadly, Tiny had finally given up the fight. Cece checked for me two days later and all was well. After that, we couldn’t open the nestbox for fear of premature fledgling. I went today and with breath held and fingers crossed, and opened all the boxes. I was greeted with an empty nest in all three! At Landmark, I spotted both adults in the nearby trees. The male was making alarm calls the whole time I was there, and the female had an insect in her beak. I tried in vain to find the fledglings that I knew were hiding in the trees. 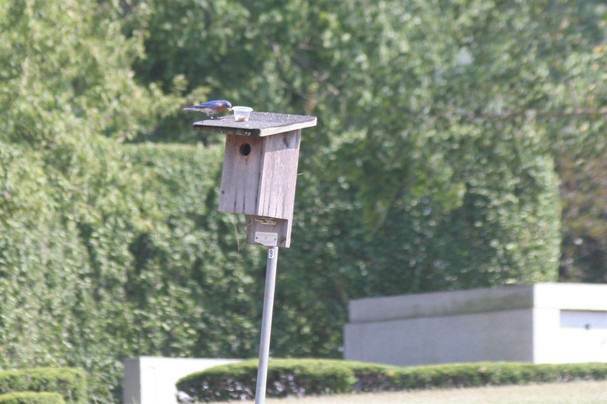 The adults’ behavior assured me that the bluebird rescue was a success. We brought 3 extra bluebirds into the world that otherwise wouldn’t have made it. Total of 25 birds, of 9 species 9 retraps and 40 observed. Again, a very hot and humid day as we approached the noon hour. More birds than last session, but still numbers are down. Because of the heat and humidity, we kept a close eye on the nets, closing nets 10 and 11 30 minutes early due to sun exposure. There was a good number of Song Sparrows, but fewer Yellow Warblers than we’ve been seeing. There was one particularly beautiful American Redstart female as well. Numbers overall are down, because birds are either leaving for the season or have grown accustomed to where the nets are located. It is also important to note that because of this extended dry period, a lot of bird numbers are down in the area. While we’re still observing a decent number of species (thanks in specific to two of our seven volunteers) in the study area, it is quite obvious that both shorebird and passerine numbers are down. 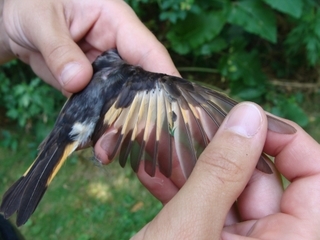 Total of 21 birds, of 6 species; 8 retraps and 38 observed. Very slow day, larger numbers of Yellow Warblers and Song Sparrows. Seven volunteers came out on an increasingly hot and humid day. Net 12 was closed at 7:10am, after the second net check, because two of the volunteers were stung by angry and beligerent hornets, not typical bees. We later determined that the nest had fallen and the increased activity had caused them to seek out victims. I got stung the day before while setting it up, but simply thought I was unlucky; after the other two got stung we took no more chances and closed the net. At the 7th ANNUAL COOL KIDS! ECOFEST held Saturday, April 14, 2012 at Genesee Community College representing BBBO, Pat Lovallo operated a display table and interacted with attendees to bring awareness of our organization and the work we do. 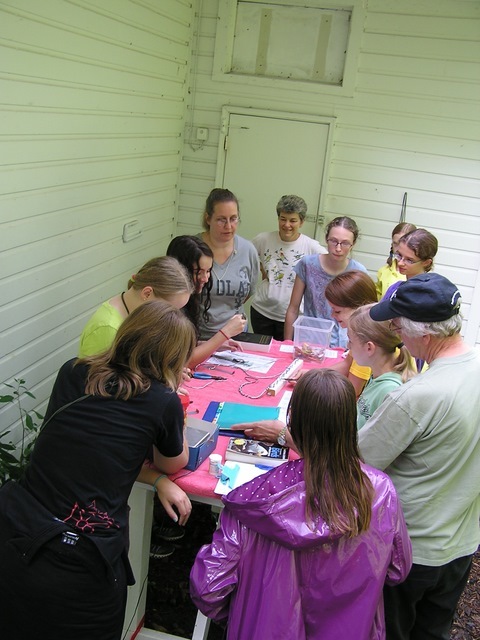 The ECOFEST is a very big and well attended nature festival and it is the second time BBBO has participated in it. On April 21 and 22 of 2012 she also manned and presented our traveling education displays at the Braddock Bay Raptor Research BIRD OF PREY DAYS festival. Our participation has been a yearly event for at least the past decade. We had 33 total birds of 8 species, only 5 recaps and roughly 26 species observed. 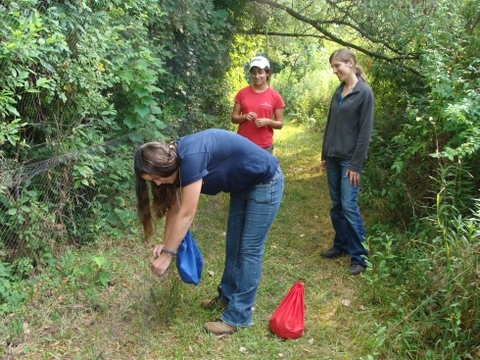 Two of the GLISTEN USLs and a Pittsford Sutherland high school intern volunteered again today to help net-pick and they even started some banding. There were significant numbers of hatch year Gray Catbirds and Baltimore Orioles, despite for the most part the adults having moved on. This is partly evidenced by the number of retraps per session declining. While there was considerable rain (to finally end the nationwide drought) the night previous, the weather held up perfectly for the day, albeit the start was a little damp and dark. Some trail pruning was required due to heavy leaves sagging into net areas. The first Teen Bander Training Class has come to an end! 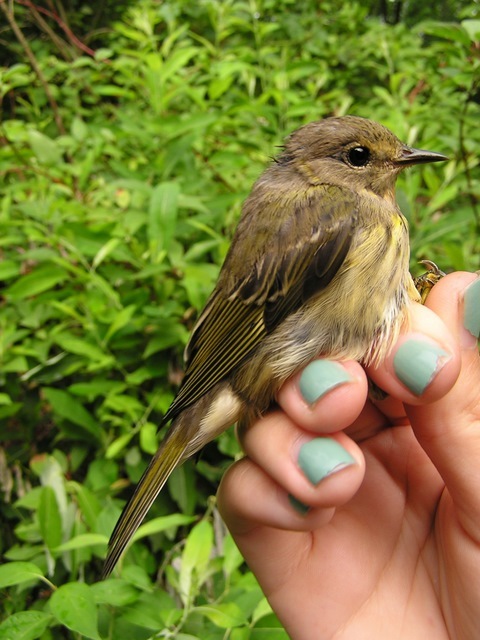 Collectively, the girls banded 71 new birds and processed 21 recaptures, including Blue-winged Warblers, American Redstarts, Yellow Warblers, Common Yellowthroats, Traill’s Flycatchers, American Goldfinches, Black-capped Chickadees, Red-eyed Vireos, Warbling Vireos, Swamp Sparrows, Song Sparrows, Cedar Waxwings, Downy Woodpeckers, Tufted Titmice, Gray Catbirds, and American Robins. 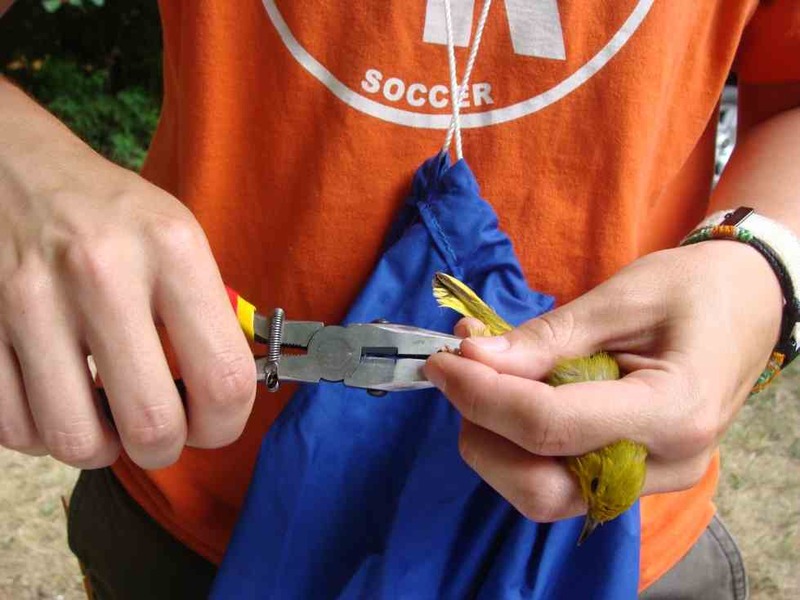 They net-picked around 125 birds, scribed for each other, and learned the basics of aging and sexing birds (including how to use Peter Pyle’s identification guide!). 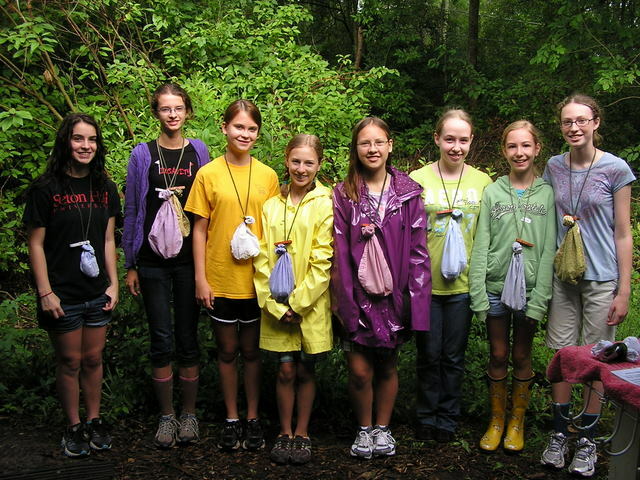 All eight girls show remarkable promise, and we suspect we’ll see several of them at our station this fall as volunteers. Emily and I would like to thank Tom, Kathy, Cindy, Chita, Gayle, and Ann for helping us this week. We could not have done this without you, and we are so grateful you gave up a morning or two (or three!) to nurture the next generation of banders. 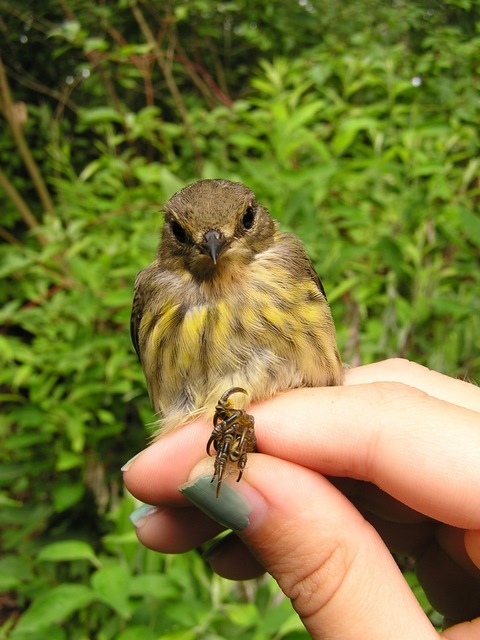 By the way – we believe yesterday’s mystery warbler was a Cape May. 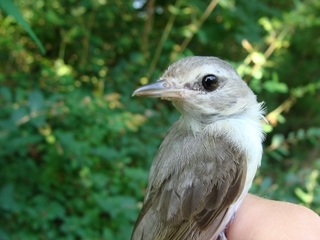 We were able to determine it was a hatch year (juvenile) bird based on a partly pneumatized skull. While the yellow feet initially had us thinking Blackpoll, we ruled it out based on the weak wing bars and the strong streaking on the breast. None of the other juvenile warblers looked quite right for this bird, and the hint of yellow going up the neck sold us on Cape May. Careful reading of both Peter Pyle and the Peterson Warbler guide lent support to our ID. It’s an unusual sighting in Rochester at this time of year, and it was great for the kids to see that even the grown-ups have to think carefully, consult reference books, and ask each other for help. Quiz Bird Stumps the Teen Banding Class! Andrea Patterson	Education	Comments Off on Quiz Bird Stumps the Teen Banding Class! I’m not quite certain why anyone tries to predict the weather in Rochester. When I woke up at 4:00 Thursday morning and checked the radar and weather forecast, I was certain the entire day would be a washout. Nevertheless, we headed up to Braddock Bay because we had told the students class would go on, rain or shine. BBBO must be located inside some sort of weather bubble, because our entire day was rain-free. While we didn’t get an overwhelming number of birds, we got enough to keep our young banders busy. Pictures will best tell the story. For the first time this week, there were birds for all! 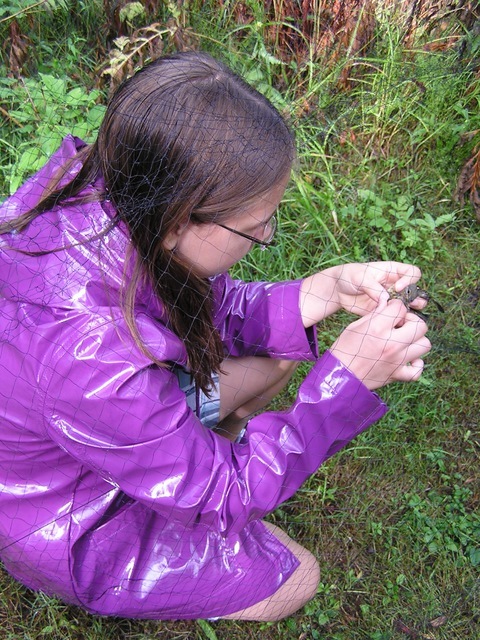 The students continued net-picking, scribing, and banding. 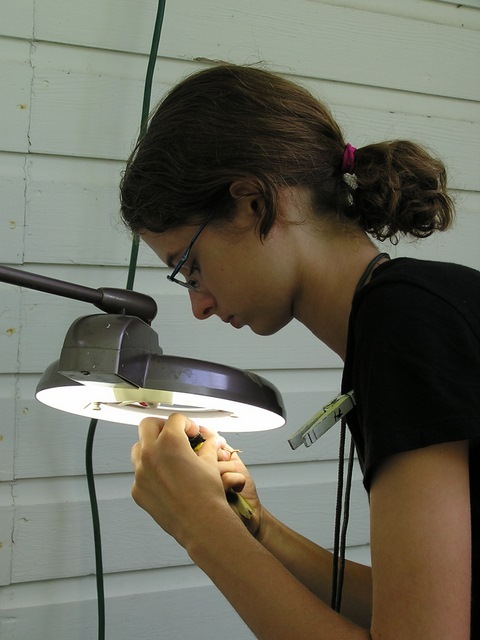 Cici prepares to band a Tufted Titmouse. 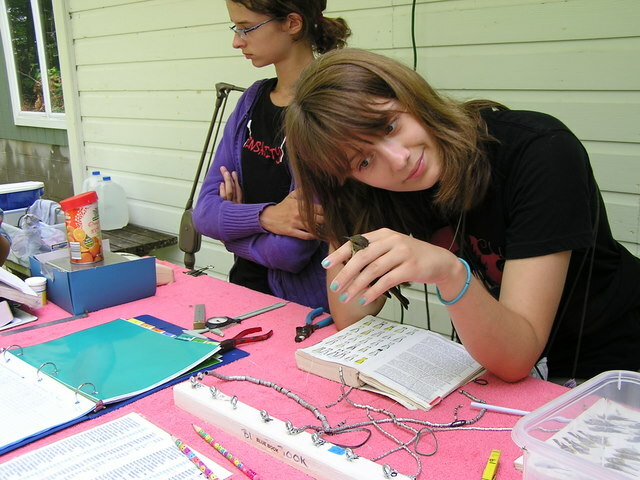 Emily quizzes Bethany, who uses the field guide to correctly identify a Warbling Vireo (as did all the students!). And then . . . we got an unfamiliar bird. Here are two views of the bird . . .
I’ll tell you tomorrow what we think it is. Any guesses?